Jips is made from a fuzzy black material with longer black and white fur around his face. 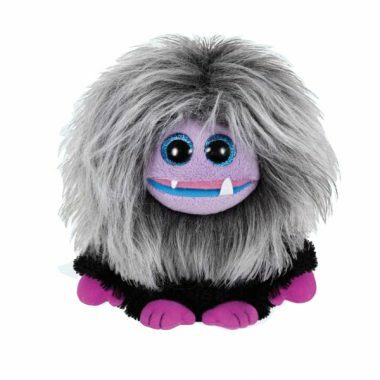 He has large sparkly purple and black button eyes and bright purple hands and feet. He has a large, white, pointy tooth on his lower jaw and a smaller tooth on his upper jaw. If you turn Jips upside down and shake him, his hair fluffs up. Jips was released in April 2015. His birthday is on 8th March. As with all Frizzys, if you turn him upside down and shake him, his hair stands on end. This is the larger 9″ version of Jips. He is also available in the regular 6″ size and as a key clip.